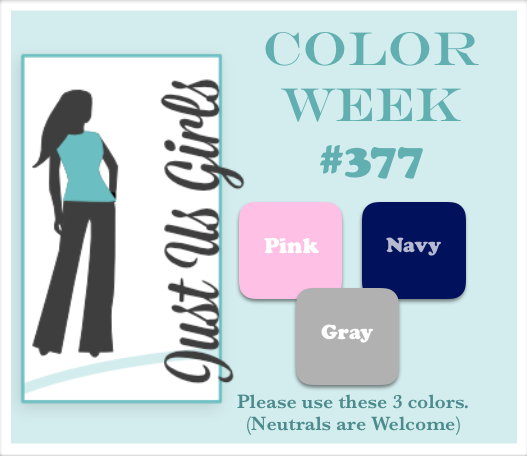 Hello Friends, Over at Just Us Girls we have a Color Challenge starting. The colors are Pink, Gray and Blue. I know you are probably thinking…not those stitched flower dies from MFT again…LOL What can I say, they are a tad addictive! I promise to break out some of my other goodies from MFT again very soon! The thanks die is from Savvy and the scalloped rectangles are also MFT. Categories: Cards | Tags: Card making, Cards, color challenge, my favorite things, rubber stamps, stamping | Permalink. If it isn’t broke, don’t fix it, Nancy. 😉 Those flowers work perfectly with the colors and your layout is divine. Great colors on this beautiful card. I love the layout too! Wonderful flowers you added as well. Awesome design! I love those stitched flowers and can see where they can be very addictive. Way to rock this challenge! Very beautiful design! Love the color combo! Gorgeous card Nancy. Love the DP layout and thosestitched flowers so soft and lovely. Pretty color combo and design. Love the flowers…very pretty card! Well I, for one, adore those stitched flowers. I love how you have arranged them, they look like so much fun. And I love your patterned paper too…really sweet card, great take on the challenge! You always inspire me, my friend!